The Bell V-280 Valor successfully achieved its namesake optimal cruise speed of 280 knots, say Bell. The V-280 is, say the builders, purpose-built to conduct long range assault at twice the speed and range of existing medium lift helicopters. 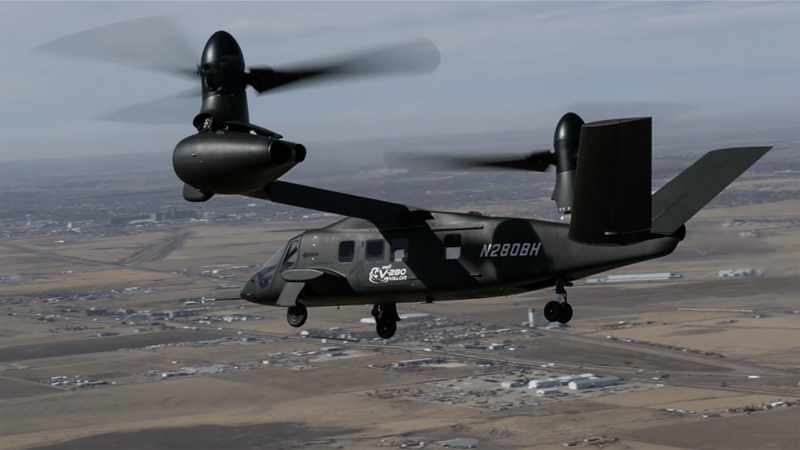 As the programme moves into 2019, V-280 flight testing will continue to prove out Bell’s key performance parameters and reduce FVL risk in the U.S. Army led Joint Multi-Role Technology Demonstrator (JMR-TD) programme. The next stages will expand the performance envelope exploring further low-speed agility maneuvers, angles of bank and autonomous flight. I can’t see these taking over from helicopters! Apart from specialised use like special forces, medi vac ect. Does the SAS fly two ospreys for in the uk? While the additional speed and range are obviously great benefits, I can’t help but feel that VTOL aircraft like this are too big and vulnerable for tactical transports. That big wing in particular seems very vulnerable when in hover mode. Personally anything other than a Merlin, it’s a mad waste, using the most expensive and by far the best ASW rotor in the world to cart around crowsnest, I sometimes don’t get our military planners. If they needed some one the merlins as crowsnest trucks why pay to upgrade them all to merlin 2 specs ? When carting around the crowsnest kit the Merlin can still swing roles to ASW. So, for example, it might spot a periscope and then go stright for the localise-and-kill allowing a 2nd Merlin (whirling and burning on a carrier spot) to take up the AEW. I hear you on the swing-role aspect, and keeping it all Merlin avoids another line of spares, maintenance specialities etc on the carriers but if the Valor has similar service ceiling to the Osprey, I.e. about 10,000 feet higher than Merlin I think, then is that extra height and hence surveillance reach compelling enough to outweighs the benefits of keeping it all Merlin? When I suggested a drone as an alternative, I was thinking of something like the Fire Scout, but this looks far better ?? V247 represents an excellent opportunity to propel our QE class carriers to the very top of global carrier capability. 36 F35 B with four of these providing AWACs is capability beyond what even the Nimitz class will be deploying this side of 2040. The current prototype has a fixed wing for testing, the next version will have a rotating wing like the Osprey. The Marines want to use this much like a Reaper for reconnaissance and close air support. Part of the requirement is that it can be used from any Marine Corps ship, but also from the helipad of a destroyer/cruiser, hence the folding wing etc. The aircraft is about 2/3 the size of a Valor. The Valor has approximately the same fuselage size as a Blackhawk, however, the width of the combined rotor disc is slightly wider. The V280 doesn’t, the V247 does. I hope that just like the lightweight fighter program from the 70s which gave birth to the F16 and F18, that the US finds a home for both of the contenders for the Future Vertical Lift (FVL) program. They likely will. 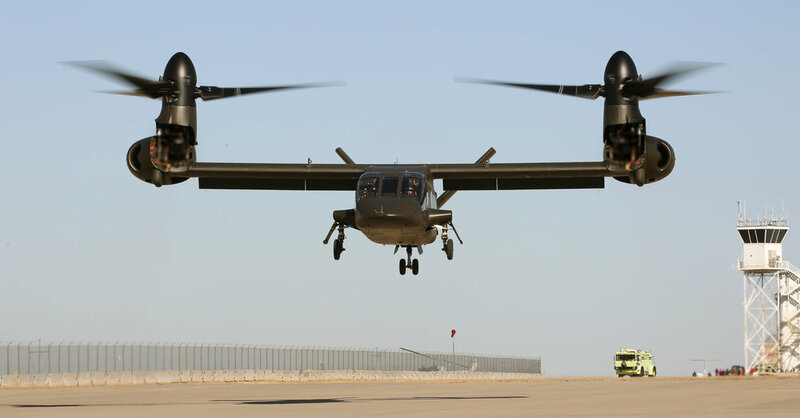 I can see the V-280 as something more for rapid response units like the 82nd and 101st Airborne along with the Marine MEUs, due to the range and speed they offer. I think the Defiant is more suited to the needs of the regular army due to likely easier maintenance (much fewer moving parts) and because of the smaller profile when landing. I love the Defiant it is a somewhat similar concept to an amazing kit model I had as a kid supposedly based on a German 2nd WW design that never came to fruition. Well not for 70 years anyway. Indeed as so many aspects of the design already long existed separately, I do wonder why no similar design ever got half way to fruition before now as far as I know. One design did the AH-56 Cheyenne gunship was a pusher helicopter that was flying, before it was canceled in favor of the less ambitious Apache and for upgrades to the Cobra. I’d like to see something like this as COD/AEW/air assault troop transport on our carriers. Far more capable than Helis. What interests me is what happens during an engine failure. The drag created by the feathered prop must be substantial leading to a violent yaw. Anyone know the details? A driveshaft runs through the straight wing, allowing both prop rotors to be driven by a single engine in the event of engine loss. Makes sense, Thanks Tim! So its all or nothing. Can one engine be run in Hotel mode or is there a dedicated APU? The manufacturer claims it can recover on just one engine in helicopter mode, they did not state if this was at all up weight or not. It will be one of the US Army’s pre-requisites, much like the Osprey. An interesting piece of kit. Curious as to why Bell pulled out of the Augusta Westland 609 program just to develop this very similar military only product in isolation. It looks like the 609 has it fairly well beaten on specs.